Topics: China Photos, Mahjong Readings, Free Chinese Astrology,, Find A Chinese Zodiac Match,, and Free I Ching (yijing) Readings. The site has about 63 users daily, viewing on average 1.50 pages each. 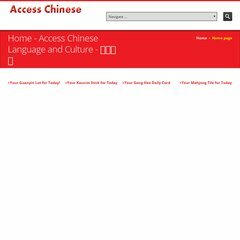 Accesschinese.com's server IP number is 70.86.119.18. Its 2 nameservers are ns12a.axanti12.com, and ns12b.axanti12.com. It is hosted by American Registry For Internet Numbers (Virginia, Chantilly,) using Apache/1 web server.